There couldn’t possibly be a better position on Long Island’s North Fork than that of Sound View. 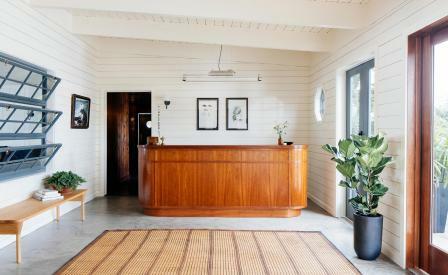 Located on a private strip of beach in Greenport, the hip ocean-facing hotel, which was once a landmark in the area, recently received an overhaul courtesy of Brooklyn-based Studio Tack. Inside, the 55 cedar-clad rooms have modern, custom furnishings: burgundy quilted bedspreads, hand-woven float rope rugs and pinstripe chairs. Each room spills out onto decks (private or shared) where outdoor lounge chairs gaze over the Long Island Sound estuary. At the Halyard, New York City chef Galen Zamarra serves up unfussy, seafood-focused dishes and elevated American classics like whole steamed lobster with street corn and broiled oysters. The tables on the outside deck, with their ocean views, are undoubtedly the hottest seats in town. Meanwhile, stormy seaside evenings are best spent listening to live music (which is in partnership with Joe’s Pub in NYC and takes place on Saturdays) and sipping artisanal cocktails at the adjoining Piano Bar. For those who want to explore the North Fork, chic custom-made bicycles (which have cute woven baskets for shopping) are available for rent, while back at the hotel, the sea-facing pool is utterly irresistible. On-property activities include yoga and meditation or simply melting into one of the couches in the lobby Lounge, while watching the sun set – doing anything else might be hard to justify.